The FUJI X PASSION project is a meeting point to all passionate photographers using the Fuji X system, whether professionals or amateurs. For all those seeking relevant information about this camera system, news & reviews, tutorials and useful tips from photographers using the Fuji X system in their daily work, this is definitely the right place to be. Every week we'll continue to offer excellent blog posts, free for you to read, as we have always done. But now, if you wish to be part of this fantastic community, or support the Fuji X Passion project, you have two subscription plans to choose from. The Premium Plan will give you access to a world of advantages, like access to all previous magazines, Special Editions and all back inspirational videos that we produced and to an exclusive Premium area, composed by articles just for subscribers. PREMIUM | With a price of 60.00€ (approximately 67.00USD), this annual fee represents a monthly value of 5.00€ (5.50USD), that is an absolutely unbeatable cost/benefit ratio. 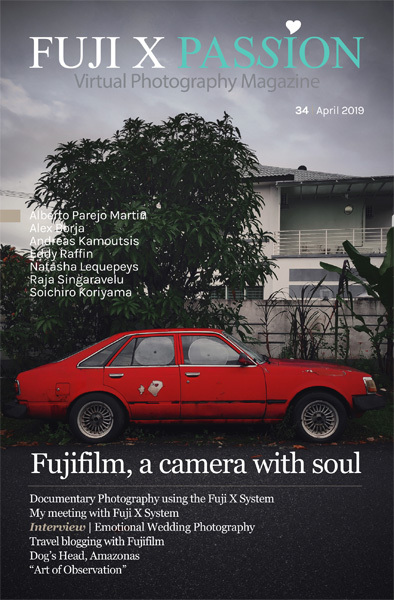 The Fuji X Passion Photography Magazine is a digital magazine and can be downloaded exclusively from our website. Our products are digital and can be read, viewed or downloaded immediately after purchasing a subscription. We therefore have a strict no refund policy for all subscription plans. Please ensure you have downloaded all issues paid for while your subscription is active. If you allow your membership to expire, you will be unable to download any further issues. If you need any kind of assistance, please don't hesitate to contact us - use our 'CONTACT' page. We aim to reply as fast as possible.